Allegations that comedian and actor Bill Cosby drugged and raped dozens of women have swirled about for years, gaining more traction recently, as more victims and survivors have come forward to tell their stories. After Cosbyâ€™s self-incriminating testimonyÂ dating to 2005 was made public last week, even his most hardened supporters (except, ahem, his wife) have finally had to admit that he might not be the real-life equivalent of Dr Cliff Huxtable we all know and love from The Cosby Show. 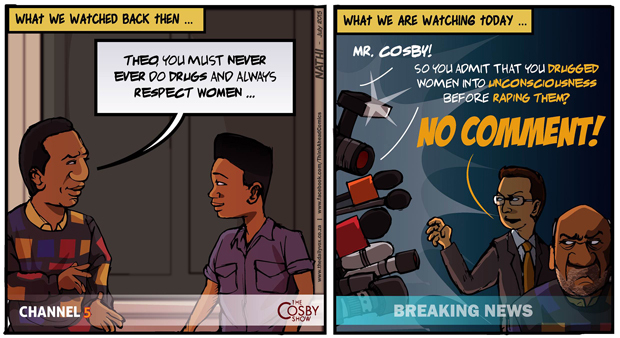 Part of the discomfort around Cosby’sÂ abuse is just this â€“ the disconnect between how Cosby acted in real life, and his on-screen persona as Dr Huxtable. Writing for Salon, Brittney Cooper outlines why Cosbyâ€™s behaviour feels like a tragedy and betrayal to black Americans, and describes it as a “mourning for fatherhood lost”.